Apply the term "hypothesis," and investigate the science of color. Fill 3 empty baby food jars with water. Add enough drops of food coloring to each jar, until you have 3 jars with the primary colors: red, blue and yellow. Fill the other 3 jars with clear water. Put all materials on a rimmed cookie sheet. 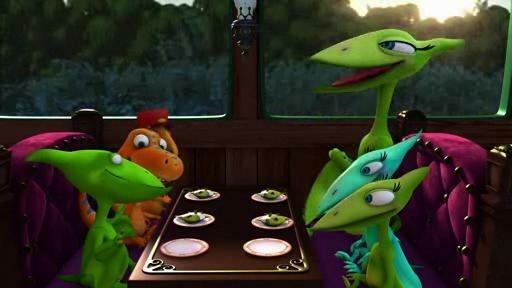 Watch the Dinosaur Train video clip of Buddy proposing various hypotheses. Explain that your child will be doing an experiment with colors. He will mix different colored water together and find out what new color is made. Before your child does any color mixing – he will make a hypothesis or prediction. In other words, he will guess what the new color will be. Point out that sometimes a hypothesis is right – and sometimes it is wrong. Either way is no big deal. 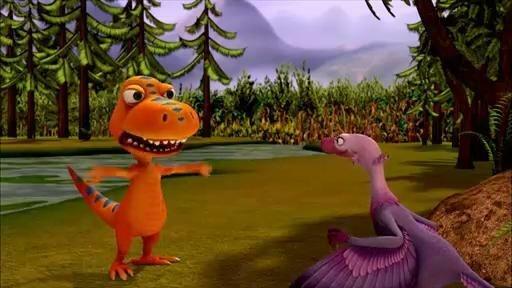 Remind your child that Buddy sometimes tests his hypotheses and discovers that his guess was wrong. The important thing is to make your best guess and learn from the results. Tell your child that he is going to write down all his information on a chart. Explain what each column of the chart means – Colors, Hypothesis, and Results. At some point, you may wish to point out that the plural of Hypothesis is “Hypotheses” (Hi-PAH-thuh-SEEZ). Or simply say, “Excellent Hypotheses” when your child talks about more than one color prediction. Show all the materials to your child. Explain how to use an eye dropper to remove a small amount of colored water. Let your child try one, and see if he can control the dropper to release a certain number of drops. Encourage him to squeeze out only one drop of water at a time. Take your child through the first example on the chart by asking him to predict what color will result if he mixes 5 drops of blue water with 5 drops of yellow water. Before mixing the colors ask: “What is YOUR hypothesis?” You could then paraphrase this question as, “What new color do you think we’ll get if we mix 5 drops of blue and 5 drops of yellow?” Before your child mixes the colors, you could say something like, “Time to TEST your hypothesis!” Follow the steps on the printable page to record your results. Repeat the above step with all color combinations on the chart. As a challenge, an older child can try this experiment backwards. He can "secretly" create a new shade of colored water by combining 2 colors in different quantities (example: 5 drops of red with 10 drops of blue) – then see if you, or another child, can figure out how this color was created. Encourage your child to use the word "hypothesis" in their discussions. For example, your child might say, "My hypothesis is that you mixed red water and yellow water – but I don’t know yet which color you used more of," or, "My hypothesis is that you used more yellow water."